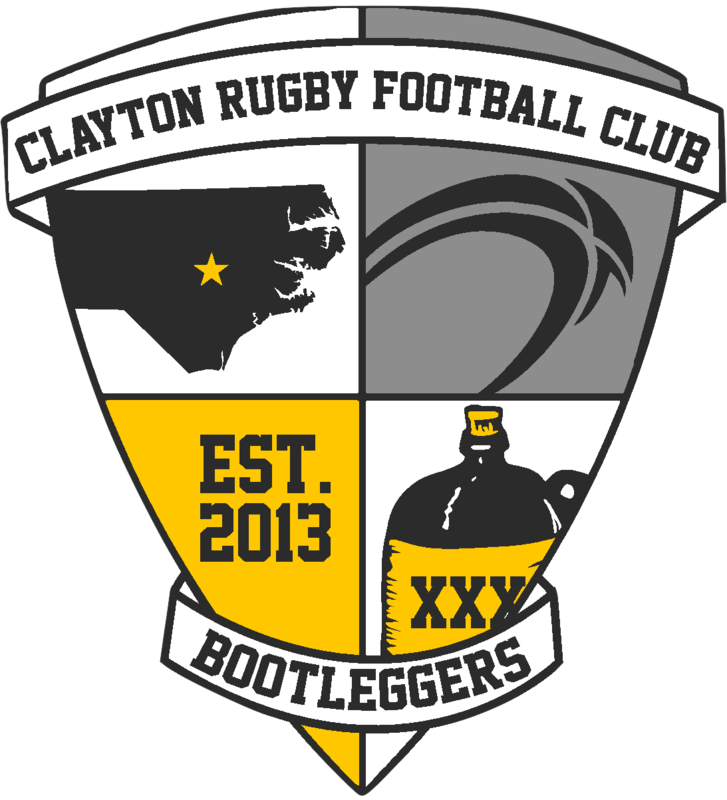 RALEIGH, NC – Last night the Clayton Bootleggers opened up their 2016 Summer 7s season with a strong showing as they went 3-1 at the 2nd Annual Moonshine 7s hosted by the Raleigh Rugby Football Club. Clayton took a deep squad to the tournament with a mix of experienced 7s players and Bootlegger Rookies. The Bootlegger’s two leading 7s scorers from 2015, Anthony and Chris Crumity, were both back in the squad as were Brendan Fitzpatrick, Jon Rogers and Adam Hockaday whom all gave the team solid minutes and leadership in 2015. Connell Smallwood and Walter Webster have also seen 7s action for Clayton in past seasons. The rest of team representing Clayton at the Moonshine 7s were new to the club and 7s. Jerry Artos, Brandon Roggow, Les Shelton, Wes Smith, Dylan Carter, Travis Morrison, Eric Tansey, and Paul Castellana all made their Bootlegger debuts this past Spring. 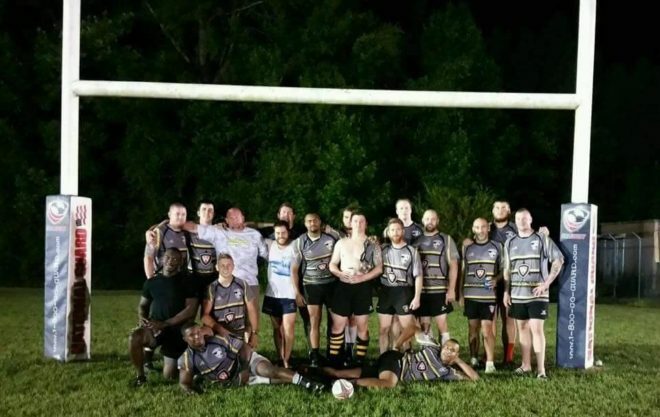 Nathan Smith, who just joined the Bootleggers, played in his first ever rugby match last night in Raleigh. The Bootleggers opened up the tournament with a tough draw as they ran up against Southern Pines and their Tiger Academy crew. Southern Pines put in a clinical performance as they took down the Bootleggers 30-12. Chris Crumity and Travis Morrison both scored for Clayton and Brendan Fitzpatrick added one conversion. The squad followed by taking on Huazihul which was a side made up of Raleigh Rattlesnake Alumni and Raleigh Old Boys. The two sides locked into a tight duel with the Bootleggers pulling out a 19-12 win to pick up their first 7s victory of the year. Fitzpatrick, Chris Crumity, and Les Shelton each scored for the Bootleggers and Fitzpatrick added two conversions. With their 1-1 pool record, Clayton fell just outside of the Top 4 on points difference which placed them in the Consolation Bracket. In the Consolation semifinal the Bootleggers faced off against another Raleigh squad as they took on the Raleigh Vipers forwards. Clayton was bolstered by a hat trick from Chris Crumity as they rolled to a 26-15 win. Anthony Crumity added a try as well and Fitzpatrick connected on three conversions. The win placed the Bootleggers in the Consolation Final against Camp Lejeune. The match up against Lejeune was a gutsy performance. Lejeune took early control of the match, but the Bootleggers put together a late comeback to sneak past Lejeune 12-10 to win the Consolation bracket. Chris Crumity led the way again as he scored two more tries, to finish the tournament with seven tries scored. Brendan Fitzpatrick added the conversion that was the difference in the score.